What better way to have fun on easter than with a few easter games! These are common games, but by changing the objects of the game from their original form into eggs makes the game all about Easter! The ancient Egyptians, Persians, Phoenicians, and Hindus all believed the world began with an enormous egg, thus the egg as a symbol of new life has been around for eons. The particulars may vary, but most cultures around the world use the egg as a symbol of new life and rebirth. A notation in the household accounts of Edward I of England showed an expenditure of eighteen pence for 450 eggs to be gold-leafed and colored for Easter gifts. The first book to mention Easter eggs by name was written five hundred years ago. Yet, a North African tribe that had become Christian much earlier in time had a custom of coloring eggs at Easter. Long hard winters often meant little food, and a fresh egg for Easter was quite a prize. Later, Christians abstained from eating meat during the Lenten season prior to Easter. Easter was the first chance to enjoy eggs and meat after the long abstinence. Use empty egg cartons as drying racks. Keep paper towels handy to blot off any dye that pools underneath the eggs. The secret to beautiful eggs? Let them dry thoroughly between coats of dye. To make your own natural dyes, boil common ingredients in water with a tablespoon of vinegar until the desired shade is reached. Strain to remove solids. 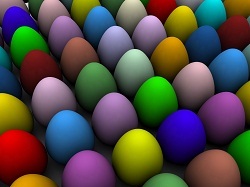 Have fun this year dyeing your eggs and using them to play the Easter games!